The Trinity College Chapel recently unveiled a new memorial to those interred in the Chapel garden. The November 4 Service of Holy Communion in honor of All Saints’ Day included the dedication of a memorial case, a chandelier, and a commissioned illuminated manuscript in the Crypt Chapel. An illuminated manuscript is artistically handwritten text decorated with colorful, elaborate borders and images. “What we honored and remembered points to the generations and the lives dedicated to all areas of campus life and the mission of the college,” said the Rev. Allison Read, the college chaplain and dean of spiritual and religious life. The new illuminated manuscript by artist Neil Bromley features a collect, or collective prayer, based on a sermon written by John Donne. Photos by John Atashian. To view more photos, click here. The illuminated manuscript by artist Neil Bromley features a collect, or collective prayer, based on a sermon written by John Donne and will sit alongside a list of the names of deceased alumni, faculty, staff, and friends of the college who are interred in the Chapel’s memorial garden. Read said she was especially delighted to dedicate the memorial on All Saints’ Day. “All Saints’ Day is one of the Principal Feasts of the church, the feast day during which Christians remember all the saints, both the living and the dead,” she said. The memorial in the Crypt Chapel Narthex includes a chandelier, a memorial case, and a commissioned illuminated manuscript. In 2010, the Chapel community wanted to develop a new means of memorializing persons who are interred in the Chapel garden. The Chapel curator researched furnishings and memorials that existed in other buildings designed by Philip Frohman, the architect of the Chapel. The curator identified examples from the Washington National Cathedral, where the Chapel community started to work on designing the elements to be a part of the memorial; these included the case, lighting, leather portfolio, and finally the illuminated manuscript, which Trinity worked on with Neil Bromley over the course of the past year. “It is rare to find artists who create illuminated manuscripts in the medieval style, so we reached out to Bromley for the job and very much liked his proposal,” Read said. 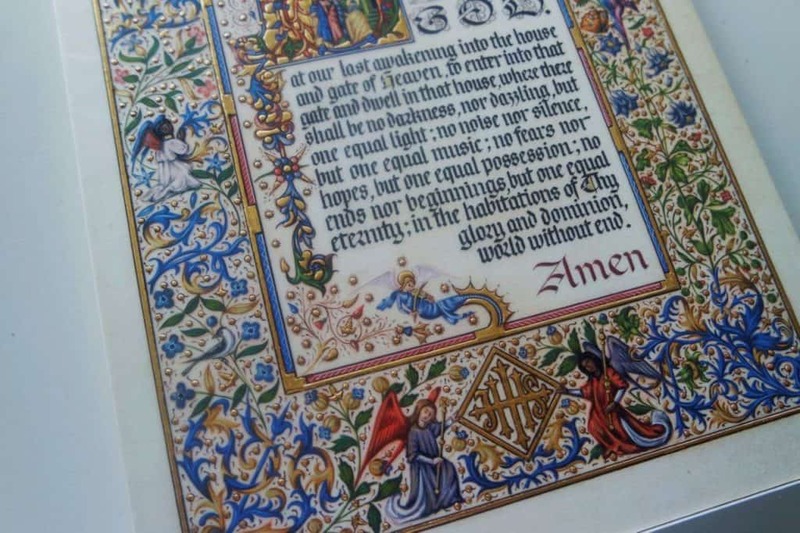 “We sought to craft an illuminated manuscript that is both fitting and worthy of its purpose. The collect is based on the concluding paragraphs of a 17th century sermon by John Donne and is expressive of the Christian hope for the afterlife.” Read found that this particular prayer resonated with people in the community. The Crypt Chapel Narthex was chosen as the location for the memorial partly because it could accommodate the memorial case. 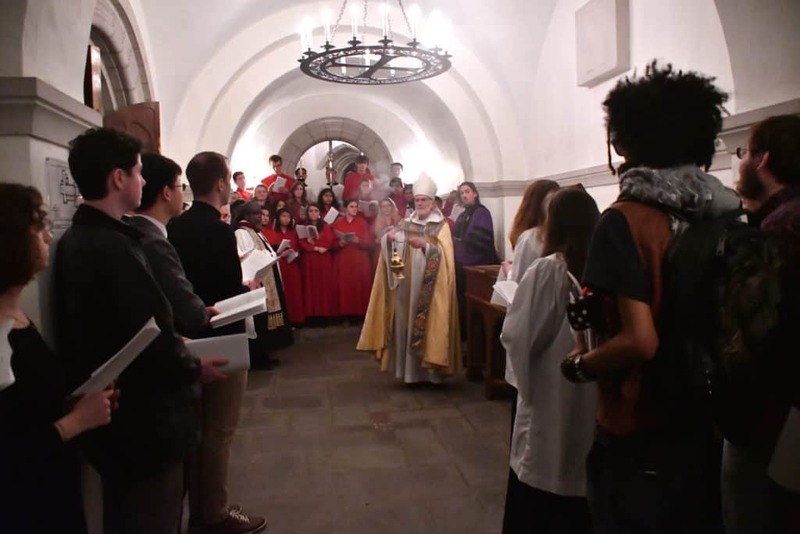 “The Crypt Chapel itself is a space that individuals use for meditation and prayer, so to have the memorial case right outside the Crypt where individuals can also sit with a degree of privacy was part of the design,” Read said. Student Aoife MacIntyre ’19 attended the memorial dedication. “The manuscript is both a work of art and a meaningful way for the community to remember and connect to the many generations of Trinity that have come before,” MacIntyre said. Click here to see the full program from the November 4 service and click here to see more photos.